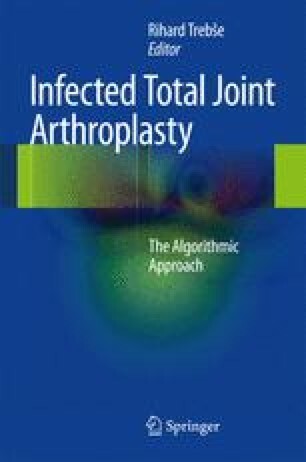 In this chapter an overview is given about the rationale of perioperative antibiotic prophylaxis in total joint arthroplasty. Currently there are only level 1a recommendations for primary joint replacements, while the recommendations for revision joint replacements are still missing because of complexity and heterogeneity of this cases and lack of randomized controlled trials as well. Current literature and available data are reviewed, and recommendations are summarized. American Society of Health-System Pharmacists. Draft therapeutic guidelines on ­antimicrobial prophylaxis in surgery. 2011. http://www.ashp.org/DocLibrary/Policy/PracticeResources/Orthopedics-ForPublicComment.aspx. Accessed 10 June 2011. American Academy of Orthopaedic Surgeons. Information statement: recommendations for the use of intravenous antibiotic prophylaxis in primary total joint arthroplasty. http://www.aaos.org/about/papers/advistmt/1027.asp. Accessed 12 Dec 2010. Association for Professionals in Infection Control and Epidemiology. APIC elimination guide: guide to the elimination of orthopedic surgical site infections. 2010. http://www.apic.org/downloads/ortho_guide.pdf. Accessed 29 Aug 2011. American Academy of Orthopedic Surgeons. Information statement: antibiotic prophylaxis for bacteremia in patients with joint replacements. February 2009. Available at: http://www.aaos.org/about/papers/advistmt/1033.asp. Accessed 12 Mar 2011. American Academy of Orthopedic Surgeons. Information statement: antibiotic laden cement: current state of the art. May 2007. Available at: http://www.aaos.org/news/bulletin/may07/clinical7.asp. Accessed 29 Aug 2011.